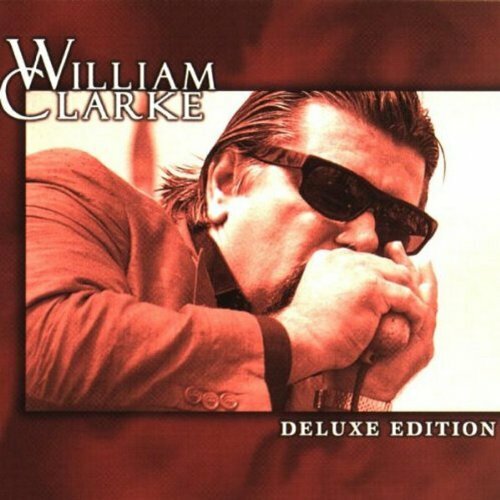 The heir apparent to Chicago’s legacy of amplified blues harmonica, William Clarke was the first original new voice on his instrument to come along in quite some time; he became a sensation in blues circles during the late ’80s and early ’90s, stopped short by an untimely death in 1996. A pupil and devotee of George Harmonica Smith, Clarke was a technical virtuoso and master of both the diatonic harp and the more difficult chromatic harp (the signature instrument of both Smith and Little Walter). Where many new harmonica players had become content to cop licks from the Chicago masters, Clarke developed his own style and vocabulary, building on everything he learned from Smith and moving beyond it. His four ’90s albums for Alligator earned wide critical acclaim and remain his signature showcases. Clarke was born March 29, 1951, in the South Central L.A. suburb of Inglewood; his parents had moved there from Kentucky and lived a blue-collar life. Clarke dabbled in guitar and drums as a youth, and grew up listening to rock & roll, but eventually found his way to the blues by way of the Rolling Stones’ early albums. He took up the harmonica in 1967, and soon found his way onto the Los Angeles blues scene while working a day job as a machinist. Clarke’s early style was influenced by Big Walter Horton, Junior Wells, James Cotton, and Sonny Boy Williamson II, but he soon began to incorporate the influence of ’60s soul-jazz, mimicking the lines of the genre’s top sax and organ players. He was a regular in South Central L.A.’s blues clubs, often hopping from one venue to another in order to keep playing all night. In this manner, he met quite a few West Coast blues luminaries, including — among others — T-Bone Walker, Pee Wee Crayton, Lowell Fulson, Big Mama Thornton, and George “Harmonica” Smith, who ultimately became his teacher and mentor. Smith and Clarke first began to perform and record together in 1977, and kept up their relationship until Smith’s death in 1983. In the meantime, Clarke guested on sessions by West Coast artists like Smokey Wilson and Shakey Jake Harris, and released several of his own LPs, all recorded for small labels. The first was 1978’s Hittin’ Heavy, which was followed by 1980’s Blues From Los Angeles; both were released on tiny local labels. 1983’s Can’t You Hear Me Calling was more of a proper debut, though Clarke still hadn’t quite hit his stride yet. That would start to happen with 1987’s Tip of the Top, a tribute to Smith that was issued by Satch and earned a W.C. Handy Award nomination. Clarke finally quit his job as a machinist that year, and followed Tip of the Top with a live album, Rockin’ the Boat, in 1988. By this time, his reputation was beginning to spread beyond Los Angeles, despite the fact that none of his albums had yet achieved full national distribution. Clarke subsequently sent a demo tape to Alligator Records, and was immediately offered a contract. His label debut was the galvanizing Blowin’ Like Hell, which earned rave reviews upon its release in 1990 and established him as a new, fully formed voice on amplified harmonica. Clarke hit the road hard, touring America and Europe over the next year; he also won the 1991 Handy Award for Blues Song of the Year, thanks to “Must Be Jelly.” His follow-up, 1992’s Serious Intentions, was equally blistering in its intensity. 1994’s Groove Time added a horn section, bringing some of the jazz and swing undercurrents in Clarke’s music forward. He pursued that direction even further on 1996’s The Hard Way, his jazziest and most ambitious outing yet, which earned strong reviews once again.